Kissel, Kohout, ES Associates LLC is proud of the exceptional representation of our clients before Nebraska state government - including our Unicameral. We maintain constant contact with senators, our constitutional officers, and their staffs. We place a high priority in keeping our clients well informed on not only the issues of significance to them, but also how they interrelate to all issues before the Unicameral or within the Executive Branch. Our approach to the Legislature is that our clients tell the best stories and are the best advocates for what we are trying to achieve. As such, we encourage our clients to make themselves available for the highest priority issues pending before the Unicameral. We happily work with our clients to develop testimony and materials for the committee and coalitions with other interested parties to maximize results. Much like issues that face any business or association, there is no single way to handle an issue. Each one must be managed differently depending on multiple variables. 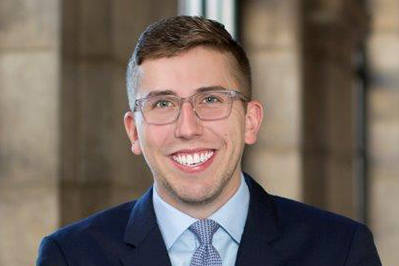 A native Nebraskan, Brennen joined Kissel Kohout ES Associates with over a decade of experience in the Nebraska public policy arena. University of Nebraska- Lincoln student is the Legislative Services Intern at Kissel, Kohout, ES Associates LLC. Elkhorn native Nate Frantz is the Government Relations Services Intern at Kissel, Kohout, ES Associates LLC. The Advocacy Group, Inc. (TAG) is the premier municipal, state, federal and international government and public affairs organization in the world. TAG’s network consists of the elite lobbyists, communicators and public affairs professionals in the 50 states, U.S. Congress, and several countries around the globe. Our affiliation with Erickson | Sederstrom grants us an affiliation with the State Capitol Group. SCG Legal is a seamless global network of over 11,000 attorneys in 148 of the profession’s preeminent independent law firms located in 82 countries around the world. By uniting their skills, expertise and influence, our member firms help leading and growing companies in every industry navigate a complex and ever-changing legal landscape.